An employment information expo to connect refugees looking for work with organisations that can assist them was held in Liverpool today. NSW Coordinator-General for Refugee Resettlement, Professor Peter Shergold, opened the Refugee Employment Information Expo which was hosted by the Australian Government in partnership with the NSW Department of Industry and Multicultural NSW. 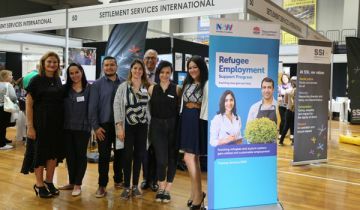 “This expo gave refugees an ideal opportunity to find out how to go about getting a job in Australia, particularly in Western Sydney and the Illawarra,” Professor Shergold said. “I’ve seen firsthand the crucial difference that overseas skills recognition, local training and careers guidance can make for refugees beginning new lives here in NSW. Many are highly skilled and experienced workers who have so much to contribute and are eager to give back. Deputy Premier and Minister for Skills, John Barilaro, said helping refugees and asylum seekers integrate into our community offered them a fresh start for the future and addressed skills shortages in key areas of our economy. “The NSW Government has invested $22 million in a Refugee Employment Support Program, which has attracted 1,100 enrolments since July this year. All of those participants are now becoming job-ready, receiving recognition for their overseas skills and qualifications and have undertaken work experience with employers,” Mr Barilaro said. NSW’s Refugee Employment Support Program is seeing encouraging results from organisations, including some of Australia’s largest employers, who have offered employment to refugees and humanitarian entrants. Federal Minister for Employment, Michaelia Cash, said today’s expo was a one-stop shop for refugees wanting to learn how to join the Australian workforce. Attendees included Settlement Services International, which is helping deliver the Refugee Employment Support Program on behalf of the NSW Government. “Attendees were able to talk to representatives from a wide range of support services, government agencies and local employers. Numerous workshops were held on the day,” Minister Cash said.